Home » Posts » Dentistry » endodontics » Post-endodontic pain: is it lower with rotary or reciprocating instruments? Post-endodontic pain: is it lower with rotary or reciprocating instruments? The incidence of pain following endodontic treatment is reported to occur in 13-65% of patients. The mechanism is unclear and considered to be multifactorial. Apical extrusion of material may play a role and this may be affected by choice of instrumentation. Benefits have been suggested from the use of rotary compared to reciprocating techniques. The aim of this review was to assess whether the incidence of post-endodontic pain was similar following procedures using rotary and reciprocating instruments. The Medline and Embase databases were searched for English language randomised controlled trials (RCTs) comparing post-endodontic pain (PP) following procedures using rotary and reciprocating instruments. Studies not recording PP using a visual analogue scale were excluded.Risk of bias was assessed independently by two reviewers using the Cochrane risk of bias tool. Dichotomous outcomes were pooled as odds ratios (OR) using a random effects model were substantial heterogeneity was found otherwise a fixed effect model was used. 3 studies involving a total of 1317 patients were included. All 3 RCTS were considered to be at low risk of bias. 659 patients were treated with reciprocating instruments and 658 with rotary instruments. Meta-analysis found overall PP incidence OR = 1.27 (95%CI; 0.25-6.52). This meta-analysis indicates that the use of rotary instruments in canal preparation is associated with a lower incidence of post-endodontic pain than reciprocating instruments. The search for this systematic review was limited to 2 databases and studies published in English so relevant studies may not have been included. No information on whether study selection or data abstraction was carried out independent is provided. Risk of bias assessment was conducted independently by two reviewers although, as assessment criteria for each of the 3 studies were rated as being unclear it is debatable as to whether they should be all be classified as at low risk of bias.The authors have also conducted subgroup analysis for pain at mild moderate and severe levels but as these involve only 2 small studies their value is also limited. With only 3 studies included in the review the relevance of a funnel plot for publication bias is also limited. While the authors conclude that results favour the use of rotary instruments only one meta-analysis is significant and that favours reciprocating instruments regarding mild pain only. So given the small number of included studies it is difficult to recommend one system over another and further clarification is needed from higher quality appropriately powered studies. Hou XM, Su Z, Hou BX. Post endodontic pain following single-visit root canal preparation with rotary vs reciprocating instruments: a meta-analysis of randomized clinical trials. BMC Oral Health. 2017 May 25;17(1):86. doi:10.1186/s12903-017-0355-8. PubMed PMID: 28545437. 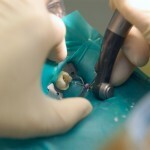 Endodontic postoperative pain: which non-steroidal anti-inflammatory drug?